How to Convert MKV/HD MKV Videos to ProRes 422 MOV For FCP 6/7/X? Have some videos in .MKV extension and would like to edit some scene in Final Cut Pro? Most of you probably know that MKV won’t work in FCP and that it needs to be converted to something friendlier like ProRes. If you’ve tried some tools like MPEG Streamclip, Handbrake, but didn’t work, you can search a workaround from the following paragraphs. We will show you an easy way to rewrap MKV/HD MKV to Final Cut Pro compatible format within 3 steps. Apparently, to import MKV file to Final Cut Pro for editing on Mac, you may get into trouble. The MKV format is not compatible with the Apple video editing applications. To solve this problem, you need to transcode MKV to some specific format ProRes 422(a lossy video compression format intended for use during video editing) supported by FCP. To help you realize the MKV to ProRes conversion, we recommend you the professional MKV to ProRes converter- UFUWare HD Converter for Mac, which is especially designed for Mac users to encode MKV video to Apple ProRes with best output quality. Overall, the program is a professional yet all-in-one video conversion tool. With it, you can easily convert all MKV files,HD MKV Files to ProRes 422, ProRes 422 HQ or 4444 for using in Final Cut Pro X/7/6. It also provides simple video editing functions for you. Besides, the Mac video converter can also convert HD videos from HD camcorders or DVs (like JVC, Panasonic, Sony and Cannon) for editing in Final Cut Pro, Final Cut Express, iMovie, Avid MC, Adobe Premiere Pro etc. Just download it and follow the tutorial below to convert MKV/HD MKV to Apple ProRes for FCP X/7/6. How to Convert MKV/HD MKV for Editing in Final Cut Pro 6/7/X? 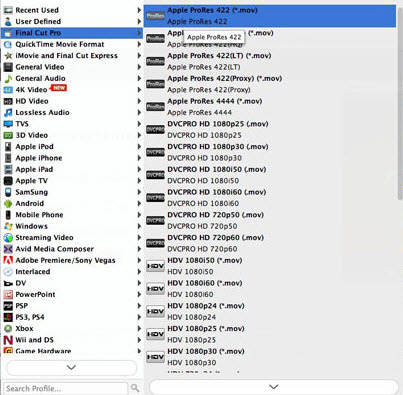 STEP 1: Launch the Mac MKV/HD MKV to FCP Converter; click “Add” button from main menu to browse your computer hard drive and select the MKV files you want to convert. Or you can easily drag-and-drop files into this application for converting. You can also load video files formatted in .avi, .wmv, .flv, .vob, .mpg, etc. STEP 3: Click Convert button to start transcoding MKV/HD MKV to ProRes for Final Cut Pro on Mac OS X. Once the conversion completes, you can click “Open” to find the .MOV videos which can be directly imported to FCP 6/7/X. You’ve done.